Give the Dog a Bone is the last book in the 'Allie Babcock' series, as well as the last book written under the author's real name. O'Kane now writes under the pseudonym Leslie Caine for her 'Domestic Bliss ' series. In Give the Dog a Bone , expert dog behaviorist and therapist Allie Babcock is back to her routine, nosy sleuthing. This time she helps a crazy man named Ken Culberson (who is a millionaire yet lives in a trailer) train his dog when he thinks its channeling his dead wife's spirit. Soon enough, Ken dies and since Allie is named the dog's legal guardian, becomes smack-dab in the middle of figuring out who whacked him for his money. 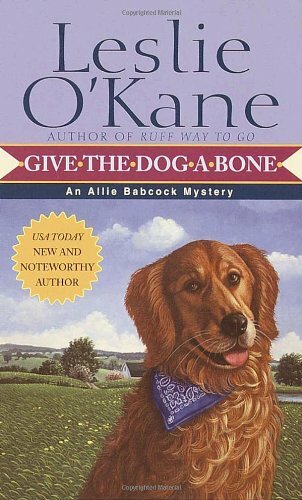 Although the plot and mystery leaves much to be desired, we can count on O'Kane providing us with some awesome and effective tips about training and taking care of dogs. Allie's canine expertise is sprinkled throughout the book as we embark (no pun intended) on a journey to pinpoint the murderer. Considering Give the Dog a Bone was released in 2002, it seems as if it were written before that time. Allie's boyfriend Russell has a waterbed which I thought people stopped using during the late 1980s, and in the midst of many dangerous scenarios, no one ever has a cell phone! I realize I may be nitpicking here, but in an adverse way it does somehow add to the charm of the book. As I have now officially read everything under the moniker Leslie O'Kane, I am still sticking to my guns that her fax series featuring mom and heroine 'Molly Masters' is the best! Molly Masters is one of the funniest characters I have ever known in the cozy mystery genre. The first book in the series is called Death and Faxes . Before you decide to pick up Give the Dog a Bone , read the first two books in this trilogy: Play Dead and Ruff Way to Go .